While attempting to make a grocery list last night, I realized I have no idea how to cook anything that won't immediately clog all your arteries and kill you. I love comfort food, but making and eating it is really affecting my diet. I had biscuits and gravy for dinner last night, which is so crazy good, but does nothing to aid my weight loss efforts. The thing is, two summers ago, when I was losing weight, I cooked a lot of great meals that were healthy. Now, I can't remember a single one of them. All I can come up with is chicken and fish, but I see that getting really old, really fast. So, I'm on the hunt for really good, really good for us recipes to help keep me on track so that I can get groceries. I've been looking at SparkRecipes and I've found some really good things I want to try, but there are so many recipes, it's almost impossible to sort through them all! So, I'm looking for suggestions... what do you like to eat that's good, and good for you? Share with me! It is not without some amazement, and a little amusement, that I write today. I went to see Melanie yesterday to catch up and when she saw me she all but insisted that I'd lost weight while I was in California. I shook my head, no I hadn't, I thought, but it's always nice to hear that someone things you look thinner... especially someone who sees you all the time. I went about my way, thinking nothing else about it, because I had/have a lot of other things on my mind right now. Then, when I dragged myself out of bed this morning, I accidentally pulled on a pair of pants that don't fit me. I buttoned and zipped them and went about my way and it wasn't until I'd been awake nearly a half an hour that I realized the pants I was wearing were crops. They haven't fit me in months, not comfortably at least, and here I was sitting down in them... and comfortably! Of course, you can imagine what I did next. Dragging the scale (evil thing!!) out from behind the cabinet, I took my weight... then I took it again... and then a third time. The thing said I was down 9 lbs from where I was when I left for California!! I was still sad about my weight, which happens every time I weigh, but I was also more than pleased to see that I'm a few pounds lighter, especially given how hard it generally is for me to lose weight. So, with that surge of happiness still coarsing through me, I stepped off the scale but didn't put it away. I decided that right now, on the impetus of that 9 lbs, I'm going to try to make something of it. While I was in California, I got a copy of The Spark (Thanks, Candi!) which is a book written by Chris Downie, the founder of SparkPeople. Though I've used SparkPeople before, and loved it, and lost 15 lbs while doing it, I fell off the wagon and couldn't bring myself to keep using their site (largely out of embarrassment). Well, I've gone back now and signed up for a new account, and am going to work on shedding the excess pounds. I feel really good about this right now. I feel like the book, plus the 9 lbs off, makes this a really good time to do something positive for myself. Right now, my weight-loss goal is HUGE (no pun intended, I assure you). I'm going to share it with you, because it's important for me to be honest. Right now, I'm looking to lose 92 lbs. When I get to that, and I do say when and not if, I plan to try to take off at least another 30 lbs. All in all, my goal is another 122 lbs. It's scary and I know I'm going to get frustrated from time to time, I may even cry and contemplate giving up, but I think it's something I can do. Most importantly, it's something I WANT to do, for myself, right now! So, with the help of SparkPeople, today I start my weight-loss journey. Sounds corny, I know, but it's the truth. I'm going to go grocery shopping as soon as possible, get Matt out to walk with me, and try Alli again because I really think it helped me last time. Anyway, I'm off to get ready for school, have class tonight and still haven't had dinner. Well, I guess the news right now is that I'm home safe and sound. My aunt and I got in to Springtown about 6:30 p.m. last night, and when Matt got there to pick me up we went out to BBQ with my Aunt Sue and Uncle Ed before heading home. We got here about 10:30 p.m or so, I took a shower, we spent some time together, and I hit the hay. I must say, though I miss California, and my family and the friends I was able to reconnect with, it's also good to be home and sleeping in my own bed... I just wish that bed was in California and not Texas, but we'll get that little problem fixed as soon as humanly possible. Come on May 2012, hurry the hell up and get here! Anyway, my trip to California was really nice. I had the chance to see my mom, dad, and Candi, Aunt Sue and Uncle Ed, Grandma and Papa, Aunt Wanda, cousins Ron, Shana, and their little boy Joseph, Aunt Pam, and Jodi and Shannon. I have a few friends in California I was regretfully not able to see, but am hoping to get together with next time (Kristine, Mary, Mayren, & Brenda, most notably). It didn't seem like nearly enough time, as I was only in California for 7 days counting the day we got there and the day we left, but I really feel like I was able to make the most of it anyway. I'd say it was a booming success considering the short notice. I only found out that my aunt was going at all about two weeks before we left. While I was in California, my mom took me all over the desert. We went to the High Desert Farmer's Market, at Victorvalley College, which was huge! We went to an amazing bakery in Apple Valley called The Cake Shop where I got cookies, she and Candi got Canoli's, and my dad got a Lemon Drop Cupcake. We also went to this fantastic antique shop in Hesperia called Carriage House Antiques, where I wanted everything, but most especially the cranberry glass dishes! I couldn't find a website for Carriage House Antiques, but if you click the link you'll be able to see it! We also went around and looked at apartments. Today, I've been looking at their websites, trying to figure out what they cost so that when we move, I have a general idea. I know, it's still a few years off, but I'm in the giddy frame of mind about it. I want it now, and looking at apartments is helping me cope with my desire to pull up stakes, which we can't do for at least two years. I've found that apartments in Victorville are cheaper than those in Hesperia, ran by the same property company, and so we might be living in Victorville instead. $400 less a month is a huge difference for the same or more square footage. Some nice looking apartments, too, like Wimbledon in Victorville, where you can get 950 sq. ft. for $725/month. That's pretty good, I think, for a 2 bed, 1.5 bath apartment with laundry hook-ups. Of course, I'm not sure where Jasmine is in Victorville, but the apartment's look nice, anyway. I was able to get together with Jodi last Tuesday, and then both Jodi and Shannon on Friday. It was really, really great to see them after all these years. They've hardly changed, they look exactly the way I remember them, though I know the same can't be said for me. We went out and had dinner, and I got to see Jodi's house. That little pond in front of her house is even cuter in person! I just love her place there in Hesperia (and I LOVE her dining room table and chairs, I must say!). We all had a good time catching up, we cleared the air on some issues, and shared our lives as best we could over the last 11 or so years. It's really interesting to reconnect with people who you haven't seen in years, but who blog, and read your blog. I must say, I'm so glad we got to get together again. It's filled me with nostalgia and it's a little funny, too, because the truth of the matter is, we're all so different on so much. The one thing that drives us to be friends, at least now a days, is our desire to be friends. We've found comfortable middle ground, for which I am most grateful. The trip there and home were nice too, though seeing my grandma was hard. She's sick, has been through a lot over the last two years, and she looked a lot different than I remember. She still looked like grandma, and she didn't, and I know it was hard for her when I left yesterday. I also know she was very glad to see me, as I was her, and from what I hear she's very taken with my manners and how much of an adult I am nowadays. Even my Aunt Wanda who hadn't seen me in almost 15 years, thinks I've turned into quite a lovely adult, settled and comfortable (as opposed to childish and unsettled, which I was with Mike). I'm happy to hear that they all approve, lol. Seriously, though, it's nice to know everyone was happy to see me. Matt and I are planning to go back in June (most likely) and see them again when my folks come out from California. So, there you have it. I'm off for now because Matt's hovering, he wants to go out and eat. Can't say I blame him, he missed me as much as I missed him... and we're hungry. * Short Update: Someone related to the Carriage House Antiques was nice enough to leave me a comment with the web address. So, I've included it here. When I was growing up, my family took a road trip to Texas most years. It was something we always looked forward to, we'd stop along the way at places like the Meteor Crater and Grand Canyon in Arizona and Carlsbad Cavern in New Mexico and my folks would give us $100 each to do with what we pleased for "vacation money." This was their answer to allowance. Rather than getting allowance we got money for souvenirs along the way. Genius if you ask me, I mean, had they given us that money during the year, we'd have used it to buy scruncii's at the mall or something and would have had nothing for vacation. Anyway, now that I'm all grown up, rather than taking trips from California to Texas, we're going from Texas to California. Matt and I have driven to California twice, in the last 11 years, and I'm on the road with my aunt right now, and I find that though I'm not much of a traveler, I still enjoy the trip between CA and TX (or vice versa) along I-40. We did take a bus to CA one year from Waco, which was a total nightmare, and it took I-10, but there's just nothing down there (except maybe Shawn in Phoenix, lol), so we always like to take the I-40 when we can help it. My Aunt Sue and I left California around 11:30 a.m. this morning, which was about an hour and a half later than we had planned. Still, after a late start, we made it all the way to Holbrook, AZ before calling it a night. It's about 480 miles, which isn't a bad start toward the almost 1,100 miles or so between Hesperia, CA and Plainview, TX, where we'll stop to see family before continuing on to Central TX. So, tomorrow, we have about 580 miles to go. It was really hard for me to leave CA this time. I always have a hard time leaving because I know it'll be a while before I can see my folks again, but I always know that I need to go home and deal with my real life (as opposed to my awesome vacation life where I have no responsibilities). It wasn't like that this time. This time, I just wanted to stay and not go home. I miss Matt and my babies, but I did not want to go back to Texas. I just kept telling myself that I had to, but that didn't make it any easier. I tend, you see, to be one of these people that sets my mind on something and want it right then. When I want something, I want something, and that's that. Well, I really, really want to move to California. I'm done with my BA, and I'm ready, for the first time in 11 years, to go home and stay there. I have moments where I wish, and I do mean wish, that I'd never moved away. They're fleeting moments, most of the time, because I really do like Texas -- especially Waco-- but it's been really hard on me to be so far away from family for so long. Anyway, when it came time to go, I actually cried and I never cry. I cried because I wanted like hell to stay, and because my mom was crying which made me cry. I feel like such a baby, but I don't want to go back to my little house in tiny little nowhere TX. I don't want to. Yes, I know I sound like a five year old, having a little tantrum, but I DON'T WANT TO GO HOME!! Take that! So, it's getting late and I need sleep. I'm about to be off to sleep, we have along day tomorrow. Next time I get the chance I'll write more about my actual trip, and seeing Jodi and Shannon, but for now, I'm tired and I've already written too much. It's possible that it may come as no surprise that I made it to California safe and sound. We left on Friday morning, getting here on Sunday afternoon after stopping Saturday night in Flagstaff. It was nice to catch up with my Aunt Sue, since I'd not seen her in 12 years, and along the way I was able to see my grandma, which was really important for me because she's not at all in good health. It's strange, but seeing my aunt again was really comfortable, like I'd just seen her last week, even after all these years!! So, since getting here, I've just been hanging out with my folks and sister which has been great since I haven't seen them in more than two years. On Sunday afternoon my sister, Staci, and her family came over to say hello, which was... well, it was what it was. Staci and I haven't been close since we were small, but it was nice to see her nonetheless. Last night I had dinner with Jodi. It was amazing to see her after all these years!! Before dinner the other night, we hadn't seen one another in 11 years. We went out to IHOP, where we had dinner and caught up for about four hours. We had a lot to say, a lot of catching up to do, and I think between us we could have sat and talked another four hours, at least. I was really nervous to see her, for a lot of reasons, some of them shallow (like my weight), but I feel like we had a really nice time. Today I went with mom and Candi to do some running around. We went to Target, had WoodGrill Buffet, which was delicious, and went to Lane Bryant, Fashion Bug, and Kohls. I tried on several different things but walked away with a new dress, a shirt, and a little coin purse-type wallet. My mom actually bought me the dress (thanks, mom!!). This is actually a huge thing because I don't normally wear dresses. I've never found one that I liked, or that didn't make me look like the broad side of a barn. We went to Lane Bryant so I could try something on, but the dress I got came from Fashion Bug. It fits great, and makes me look more slender than I am, and the best part is that it's two sizes smaller than I normally wear. For whatever reason, the cut fits me really well. Not going to look a gift horse in the mouth on this one, just going to be grateful and move on. Tomorrow, not sure but I think we might go to a bakery out in Apple Valley and have cupcakes. Yay!! Then, Friday, I'll probably go spend some time with Jodi and Shannon, though I've not emailed Jodi back yet, so I'm not sure when. Then, unless I decide to stay another few days, I'll be leaving with my aunt on Saturday sometime, but again, not sure when. I've been thinking I'd stay a few more days, until next Wednesday, and take the train home. It'd only cost me $133 one-way from Ontario, CA to Temple, TX, but I wouldn't be home until Friday. This would have me missing two classes, but also it would leave Matt home alone another four days, and me trapped on a train with my teeth hurting. So, I don't know that I'll be doing that. As much as I want to stay, I don't think I can miss class since I have two assignments due in one and have already missed one of the other. Still thinking it through. So, there you have it. I'm here, I'm having a good time. I am missing Matt, and Anakin, and Galileo, but seeing my folks has been really nice. Now, I'm off to get some sleep because it's 11pm here and I'm not feeling good. Happy St. Patrick's Day!! It's 1 a.m. and I am absolutely exhausted. I'm writing because it's been a while; I've been really busy lately. I've said a few times that I'm going to California for spring break, my aunt and I leave Friday morning, and I've been trying to get everything that needs doing done before then. This is not as easy as it sounds, so much so in fact that the one thing I've run out of time for is getting groceries for Matt. Poor guy is going to have to do his own grocery shopping while I'm away. He asked me to make him a list, hopefully I'll have time. I have a comparative lit mid-term tomorrow night and I'm sufficiently nervous about it. She sent us some example questions, which are supposed to make you feel more at ease about what's coming, and help prepare, but all they did is make me feel nauseous and worried. I've been preparing over The Lais of Marie de France and I need to re-read it or at least skim and update my notes, but I don't think I'll have time. Hopefully what I know will be enough. I do know that when it comes time, I'll sit down and write what I know and do the best I can, but I have a lot of fear about it. My prof told us to bring at least two blue books, which is making me feel very anxious. Two blue books for one question. Three hours is all we have to write, so hopefully I'll be able to organize my thoughts enough to write a cohesive, informative essay. I can tell you this, I'll be glad when it's done and I don't have to worry about it anymore... of course then I'll worry about how I did. Tonight, I had American lit which is always a fun class. I had a short response paper due, which I got done last night, and it seemed to stand up against what my classmates were doing. The day the papers are due we go around and discuss them, which tonight took almost the whole 3 hours for eight papers. It was a good discussion and we're onto the next book, Hemingway's For Whom the Bell Tolls, which I might take to California with me because I need to have most of it read by the Wednesday after spring break. Okay, it's a lie, I probably won't take it, I'll take a book I want to read for enjoyment and enjoy reading it! I'll read Hemingway when I get home. To compound the busyness, my sleep is all out of whack. A few nights ago, I didn't get to sleep until almost 6 a.m. and got up at 2 p.m. and then last night I got to sleep at 4 a.m. and got up at 12:30 p.m.. This is a problem for a lot of reasons. With my impending trip, I have to be up at 3 a.m. on Friday morning, so I can leave by 4:15 a.m. to be in Springtown in time for Matt to get back here by 9 a.m. for a statistics quiz because his prof's a freaking tyrant and won't let him make it up. She things he's BSing her because it's the last day before spring break. GRRR. Anyway, if I'm going to get any sleep at all, I'm going to have to be in bed shortly after my mid-term, about 9:30 p.m. and even then I'll only get like five and a half hours sleep. With my sleep the way it is right now, there's no way I'll be able to go to sleep at 9:30 p.m. I guess I'm going to have to try, else my trip is going to be miserable. Okay, so now that I've bitched a bit about everything I have going on, I need to run. It's getting late and if I have any hope of being up in time to study for my mid-term, I need to get to bed. This is the last post before I head out to the west coast, but I'll try to update when I get there. Good night! I have been totally slacking on the blog-front lately, shame on me. I've been crazy busy with class, and trying to get things done before I leave for California on Friday morning, and trying to spend as much time as I can with Matt before my trip. The good news is, I should be able to update my blog along the way since I'm taking my awesome netbook. I'm also taking my camera and will try to include some pics along the way. I don't have net service apart from what I can get as free wifi along the way, or net at my moms, but will try to update when we stop in Flagstaff or Kingman for the night on Saturday. Other than school work and trip planning and husband coddling, I've just been trying to keep my house clean. Seeing how I'll be gone for a week and a half, the cleaner it is now the less I'll have to do when I get home. Matt's bound to make a huge mess while I'm gone, he's crazy messy, so more work now means less work later... or at least that's what I'm telling myself. I've got to do the grocery shopping on Tuesday and there's a video game Matt wants that comes out then, so I'm going to try to get that for him. Let's see, I also wanted to share a bit of writing news. Melanie and I have formed writing group!! We both want to write more, and we both need support, so we're writing together. She gets all the credit for this awesome idea, it dawned on her while we were in class a few weeks ago. We've decided to get together every Thursday afternoon for a few hours, to write and support one another's writing, before our Thursday class. We've had one session so far and it was amazing and productive. We missed last week because I'm a total slacker, but will be getting together this coming Thursday to write again. I'm really looking forward to it. Truly, it was an inspired idea! Then, of course, we'll miss getting together the week I'm in CA, but will pick it up again the week after spring break. Looking very forward to it and to the productivity that the first session proved to be. It definitely renewed my interest in my novel in progress, Remembering Tomorrow, so I'm working on that again. 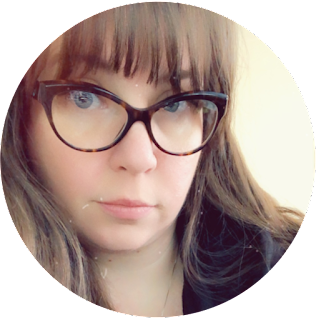 Finally, I added a "Portfolio" page to this blog as a place for me to keep a collection of links to work I've done around the net -- it's a relatively small list, but it's growing. I've also started a new blog over the last few days, a book blog called 'A Turn of Page,' if you're interested -- if you go to that site, can you tell me how it looks. It looks fine on my computers, but I like to be sure it looks okay otherwise. I need a new blog like I need a hole in the head, but I love blogging and I love books, so it works. ﻿Anyway, that's all I have for the time being. Adieu. I know that I posed a recipe a few days ago, but I just couldn't resist this one. This isn't my recipe, I found it on this blog a few months ago and I've been dying to make it ever since, but keep forgetting to get the ingredients. I managed to remember last time I was at Wal-Mart, and got around to making them tonight. 1. Mix cake by package directions. I used Dark Chocolate Fudge, but any chocolate cake will work. Use one less egg than the recipe calls for (ie. my cake called for 3, I only used 2), that way the cupcakes are less like cake and more moist and fudgy. 2. Add 1/2 c. chocolate chips. The original recipe calls for semi-sweet, but I used milk chocolate. It turned out to be a good contrast with the dark chocolate cake. 3. Spoon into cupcake wrappers. I use a cookie scoop because it's easy to maneuver. Two scoops per wrapper is about right. 4. Bake 20 minutes at 350 degrees, until a toothpick inserted in one comes out clean. Cool. 5. 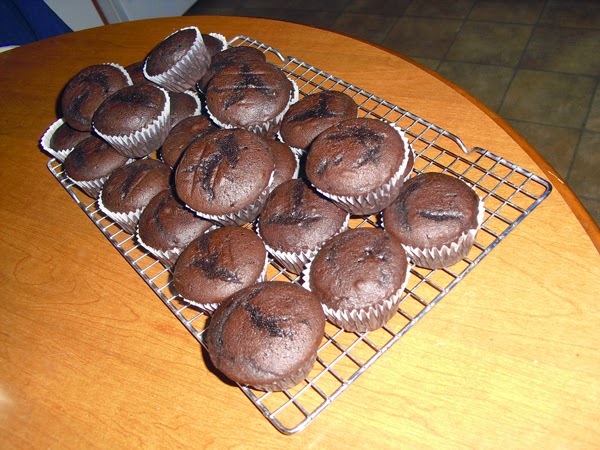 When cupcakes are cooled, clear a spot in the fridge and put down wax paper. I used foil, for lack of waxed paper, but waxed paper would be much better. They sort of stuck to the foil. 6. In medium bowl, melt butter about 30 seconds. Add vanilla, 2 c. chocolate chips, and sweetened condensed milk. Melt together all ingredients about another 30 seconds, stirring until smooth. Heat in increments of 15 seconds, if necessary, stirring between heating to make sure you don't over cook it. Overcooked ganache is not pretty, so be careful. 6. Set ganache aside for 5 or so minutes. The ganache is really runny, so letting it cool will make it easier to work with. 7. Once ganache has set up a little, frost cupcakes with rubber spatula and place in the fridge immediately. I frosted one and put it right in the fridge, repeat. That way, the cold in the fridge can slow ganache from running off the cupcake completely. It will overflow onto the sides, and the cupcakes will look pretty! 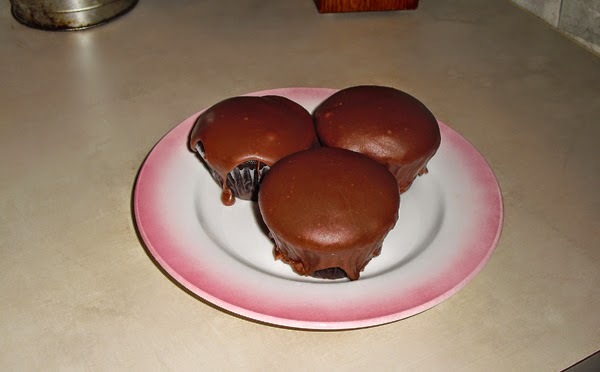 Make sure you don't try dipping the cupcakes into the ganache, it'll just tear them up... trust me on this one. 8. Let cupcakes stand in fridge for about 2 hours, or until the ganache is completely set up. When they're set up, take them out of the fridge and serve with a big glass of milk!! There you have it. The one thing I'll say is that this recipe took me a long time. It wasn't quick. I can only cook the cupcakes 12 at a time, so mixing them up and baking them took about an hour. Then, they had to cool and frosted, which took another hour or so. I may have a skewed memory of the amount of time it took to make them because I made dinner between baking them and frosting them. Then they had to sit. So yeah, not a quick recipe but worth every second it took making them, because they're delicious and because I had a fun baking them. If you decide to try it, I'd love it if you'd share pictures of yours with me. I just love the way they look!